Mosquitoes can ruin any outdoor activity during the summer. When you’re trying to have fun and relax with friends and family, being attacked by these pesky pests is not ideal. Natural mosquito repellents are the ideal way to stay bite-free. To avoid getting bitten, many of us turn to products containing DEET and other strong repellents. However, many of these harsh ingredients aren't safe for everyone to use. Is it really necessary to use such hefty chemicals? No, it isn’t. In fact, there is a wide range of natural mosquito repellents available. Some work even better than the expensive, chemical-filled products. Keep reading to see my top recommendations for battling the bite. Why Choose Natural DIY Mosquito Repellent Over Other Types? Mosquitoes are persistent little fiends. And if there is an infestation in or outside your home, you may be feeling the urge to use some mosquito repellent products. You don't have to be as careful when using chemical-free ingredients. Families, in particular,, can have a hard time keeping mosquitoes from biting their children. Babies and children can have various reactions to the bites. Some will end up with massive red bumps, which they then itch at and break the skin. Younger children don't have the option of using regular, chemically-enhanced repellents, because certain ingredients may cause severe skin irritations or allergic reactions. With all-natural repellents, there is less chance that the repellent itself will trouble our skin. This is especially important on young skin, which is easily prone to reactions. Most mosquito repellents contain an ingredient called DEET. This chemical is approved by the EPA, but it might do more harm than good. This active ingredient is not recommended to be used at a high concentration. In fact, even 50 percent can be dangerous. Unfortunately, some products contain levels close to this number. Some natural mosquito repellents actually work better than the harsh chemicals. You will have to reapply more often, but I feel that it's a small price to pay to keep you and your family safe. A robust natural ingredient to look out for is oil of lemon eucalyptus. The oil this plant produces will ensure that the mosquitoes avoid you. Many commercial repellents have a strong smell, and not a good one at that. Natural repellents, on the other hand, usually smell pretty good. If you choose a natural repellent with oil of lemon eucalyptus, for example, it will most likely have a citrus aroma. Some natural repellent recipes use a small quantity of vanilla, which gives the mixture a pleasant, slightly sweet, scent. Many of the natural repellent products contain essential oils. These are known for being repugnant to mosquitoes, and for smelling good to us. Some of the essential oil ingredients offer us a triple bonus: we can smell good, keep mosquitoes away, and do right by our skin. Lavender oil is an ingredient found in some natural products—it reduces stress and enhances blood circulation. The oil can also be applied directly on the skin. Another essential oil that's commonly found in these products is citronella. This oil is both anti-inflammatory and antibacterial. Some of the natural repellent products are created by doctors. They are aware of the ingredients and what they can do to our bodies. This is a good thing to look out for when shopping for natural mosquito repellents. Essential oils are the best and most effective products to use. They are also easy to obtain. Most essential oils can be used directly on the skin, added to a diffuser or as a candle ingredient. I have made a list of some of the best essential oils to look for when you want a chemical-free, bite-free, evening. Oil of lemon eucalyptus is my go-to when it comes to natural mosquito repellents. This oil is often confused with lemon eucalyptus oil, which is not as effective. Distinguishing between the two is crucial. Lemon eucalyptus oil is just a regular essential oil produced by steam distillation of the leaves and twigs of the eucalyptus tree. It mostly consists of citronella, and although this also repels mosquitoes, it won't last for more than a few hours. This oil is not approved by the CDC for use against dangerous mosquitoes. ​In short, oil of lemon eucalyptus (OLE) is high in PMD (64 percent) and it's approved for use against disease-carrying mosquitoes. The standard approach of using this is to buy a product mainly consisting of OLE, these usually come as a spray. First of all, figure out what you need the product to do. Should it be applied on the skin or on other surfaces? Do you want to buy a product containing OLE or do you want to make your own? I recommend creating your own mixture so you know exactly what goes into it. Choose the concentration you want for your mixture. A good choice would be between 30 and 75 percent. Keep in mind that the smaller concentrations work just as well as the higher ones. Mix 30 drops of OLE with four ounces of witch hazel or any other base oil. Pour it into a spray bottle and shake. Spray any exposed areas on your body. You can also spray some on your clothes if you fear the mosquitoes may bite through. The repellent should last most of the day if left untouched. It should be reapplied if it gets exposed to water or sweat though. And to be on the safe side, reapply from time to time. It is, however, crucial to keep OLE away from children, and the mixture should not be applied to the lips. Tea tree oil is also known to be an effective mosquito repellent. The oil is derived from the leaves of a tree called Melaleuca Alternifolia. This tree is found in different areas of Australia. The oil has a lot of benefits to our health. One of the compounds found in tea tree has been shown to kill certain bacterias. It’s often used to treat both fungal and bacterial skin conditions. Mosquitoes hate tea tree oil, and that I can understand, as the smell is not the most appealing. There are a few products available which contain the oil. But it’s also possible to make your own. Decide where the tea tree oil should be used. It can be used on the skin as a repellent, but it also makes a great repellent for clothing and other surfaces. It can cause some irritation for people with sensitive skin, so it should be used with caution. Create the perfect mixture. Tea tree oil works best when diluted with another oil or substance. Dilute the oil more if using directly on the skin. This will create an easy-to-apply mosquito repellent. Make sure that what you are mixing the oil with won’t dry out too quickly. A base like coconut oil is a great choice. The tea tree oil mosquito repellent is best used in a spray bottle. Make sure that the spray stays away from the eyes and mouth though. Although the oil is natural, it is highly toxic if ingested. This repellent won’t give as long-lasting protection as OLE, so it will need to be reapplied a few times. Peppermint has a very strong, distinct scent which is pleasant to us, but unpleasant for a mosquito’s strong senses. In fact, growing a few peppermint plants in the yard can help keep the biting pests away. Peppermint essential oil can be used in several ways. You can rub it directly on any exposed areas of skin before going out. You can also create your own mixture with other oils. Make sure to not ingest any of the oil. Peppermint can have strong effects on your stomach and very unpleasant side effects might follow, such as diarrhea. Before applying the peppermint oil to any other surface than the skin, try it out on a small piece of your clothing to make sure it won’t stain. Either apply directly onto the skin or create your own repellent mix. Start by mixing ¼ cup of boiled water with two teaspoons of witch hazel, then put in 25 drops of peppermint oil. Pour into a spray bottle and shake well. Apply liberally to the skin or clothing. The mosquitoes won’t want to come near you. Peppermint is effective but not for very long, so you will have to reapply often. Lavender, like peppermint, has a very pungent scent that mosquitoes can’t stand. Did you know that simply crushing up a few flowers and leaves and rubbing them onto your skin can give some protection from the pests? Although, this will only provide protection for a short time. Planting lavender in the yard will also help to keep the mosquitoes away, and it will also add some nice color as well. Lavender oil can be applied directly on the skin. But it can also be heated up and placed in a bowl to use as a mosquito repellent, indoors or outdoors. Combine a small quantity of lavender oil with witch hazel or coconut oil for a super repellent mix. Pour into a spray bottle and shake well. Apply evenly to the skin. Less is better in this case, more won’t make it last longer and reapplying often is better. For an even easier repellent, pour a few drops of lavender oil onto a cloth, then rub it onto exposed skin. Citronella oil is a very popular mosquito repellent. It comes in various commercially produced forms such as candles and sprays. It is also classified by the EPA as a biopesticide. Citronella is an oil that will keep the dangerous disease-carrying mosquitoes away. Note that it has to be citronella oil from the plant itself, not the citronella found in lemon eucalyptus. Mosquitoes are attracted by scents, this is why some people may be more prone to bites than others. Citronella oil works by masking the natural scent of the body. This makes it hard for mosquitoes to seek us out, leaving us bite-free. Perhaps you want to use it on the skin, or maybe as a scented candle on the outdoor dining table. Citronella works the same, either way, by confusing the mosquito’s sense of smell. When using citronella oil on the skin you can use the pure oil, or make a mix, as with the other oils. Scented candles and citronella coils can be bought at any home center. Heating some of the oil can also help to spread the aroma and keep the pests at a distance. To use on the body, simply apply to any exposed skin. You can also apply a few small drops in different spots on your clothing. Make sure to wash your hands thoroughly after using. Before using oils directly on yourself or children, make sure your skin is not sensitive to the oil. Some oils, like tea tree, can dry the skin out or cause a mild irritation. Be careful before using on children and bear in mind that these oils should not be used on infants. When applying to children, use small amounts, and never spray oils directly onto the face. Essential oils can be effective, but most of them won’t keep you protected for long. The best thing you can do before going out where there are lots of mosquitoes is to make sure you are wearing the right clothes. 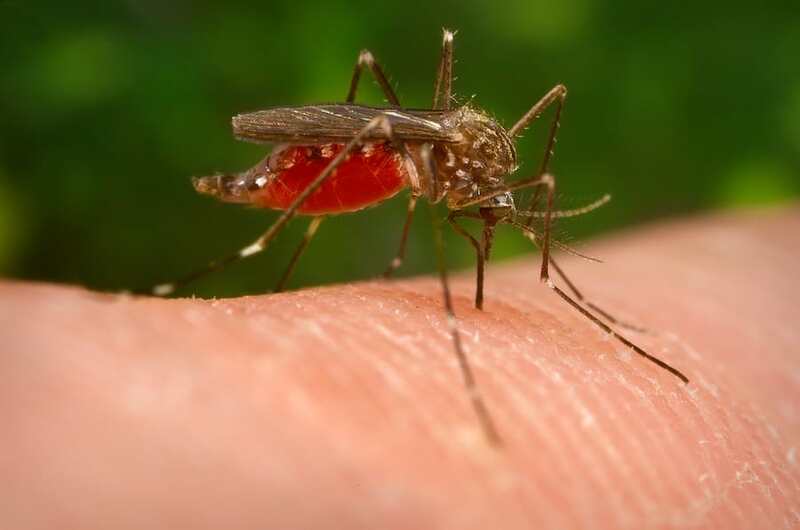 Vest tops and shorts won’t help to minimize the bites, but wearing a long-sleeved shirt and long pants will. If you are going camping or on a hike, wearing ankle boots can also help to protect your feet and legs from bites. Consider treating your clothes before getting dressed. You can use any spray mixture that you have created. I recommend using oil of lemon eucalyptus because this will provide the longest protection. None of these oils should be ingested in any way or form. They may be great at keeping the mosquitoes at bay, but if ingested they can be very toxic. Washing your hands thoroughly after applying any repellent is crucial. Be ready to re-apply often if you are using a natural product. DEET products can last a whole day, but essential oils wear off; some only last an hour or two. Mosquito repellents are a must-have for the summer. They will provide us with the protection we need to be able to enjoy outdoor activities without getting a myriad of bites, and without having to resort to a mosquito net. Although there are many essential oils that can do the job, I highly recommend using oil of lemon eucalyptus. It’s as effective as DEET, but much safer. Natural mosquito repellent is available in a variety of products. Sprays and candles are only a few of these. Diffusers are a good choice for families with small children who can’t use any on-skin products. Try making your own natural mosquito repellent by mixing a few essential oils together with a base oil. This way, you can create a super powerful natural mosquito repellent that will keep the whole family safe and bite-free.